That is, of course, the USS Trenton (CA-1) with railguns and laser emplacements slewed out to the side, performing a full broadside of all batteries as a power and weapons’ integration test. 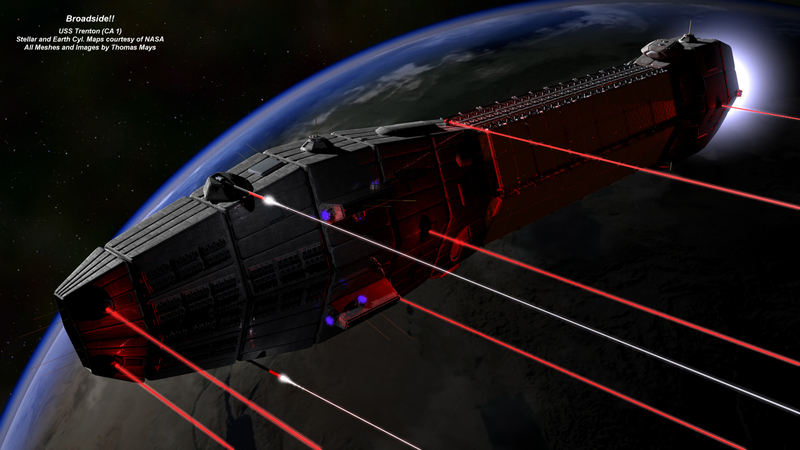 In my imagination, the cruiser’s fire control logics would have to automatically compensate for the impulse of the railgun shots by briefly firing attitude thrusters to offset the resulting spin. It is once more a Cinema 4D shot. I like this one, because it is a) cool and b) let me play a lot with hard shadows and point light sources. The Earth below is my own construct, using conformal cloud maps, satellite composites, and semi-transparent shells for the atmosphere. Speaking of broadsides and publishing, my IRL / FB friend and mentor Mark Ellis fired off his own broadside concerning the “traditional” publishing industry and how his own attitudes as a very successful mid-list author have changed concerning self-publishing. If you can get to Facebook, the post itself is very illuminating, but it expands to genius in the comments. I don’t talk much about the publishing industry here for a couple of reasons…mainly because unless you’re in it, the whole field and process is misunderstood to the point of it being arcane. Publishing underwent a vast change several years ago, known as “Black Wednesday”…the economic upheaval which affected so many other industries seriously damaged what is known as “tradtional” publishing…except, unlike the auto and banking industries, there were no government bail-outs or breathless updates every five minutes on CNN and MSNBC. One of the major changes that I experienced (other than advances being slashed) is how the final decision of what would be published now rested primarily with the sales departments…not editors or editorial committees but salespeople. In the wake of these changes, self-publishing became a viable alternative to hitherto traditionally published writers like me. Yeah, at first I considered it the same as vanity presses, but after being dealt with unethically by a publisher who first enthusiastically accepted Cryptozoica and then reneged on the agreement, I went in that direction. It was a decision I’ve never regretted. Solidly selling midlist writers like myself who spent years building a readership should just go ahead and DIE ALREADY and stop taking readers away from the writers traditional publishers want them to read. Doesn’t matter that we write what our fans want to read and buy–it’s more important we have the good grace to accept our careers are over because a handful of corporate flunkies decided they are. Here’s my counter-solution: Accept reality, fix what you f**ed up, treat writers ethically and honestly, keep your word and maybe you won’t be so scared all the time…and you just might be able to save your own jobs. Mark is a prolific author of over 40 adventure novels and thrillers, including many of the “James Axler” novels, Deathlands and Outlanders series, as well as his latest Cryptozoica. This entry was tagged A Sword Into Darkness, cryptozoica, james axler, mark ellis, Military science fiction, Publishing, self publishing, writing. Bookmark the permalink.